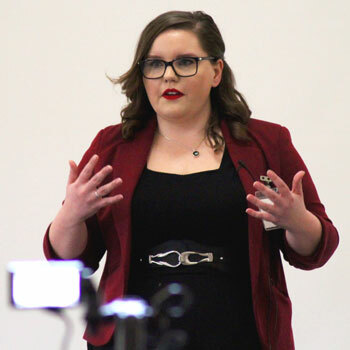 Waterloo – More than 40 graduate and undergraduate students will compete for thousands of dollars in prizes at Wilfrid Laurier University’s Three Minute Thesis (3MT) event on March 27. Competitors are challenged to present their research in a way anyone could understand, in three minutes or less. They’re allowed one slide but no notes and no props. The competition has historically been open only to master’s and doctoral students but this year undergraduates will also compete. Undergraduates will be presenting on topics as varied as tourism, fish populations and metal nanoparticles while master’s and doctoral students will present on food sovereignty in Canada’s North, representations of disability in film and protein structure and function, among many other topics. A variety of disciplines will be represented, including psychology, applied computing, health sciences and religious studies. Competitors will vie for $3,500 worth of prizes and the winning graduate student will go on to represent Laurier at the provincial competition, which will be held at McMaster University on April 17. Laurier’s Three Minute Thesis competition runs from 9 a.m. to 4:30 p.m. March 27 in the Senate and Board Chamber on Laurier’s Waterloo campus. The event is free and open to all, with no registration is required for spectators. For more information, visit students.wlu.ca/3MT.